Comments Off on Edible Espionage is available as of TODAY! 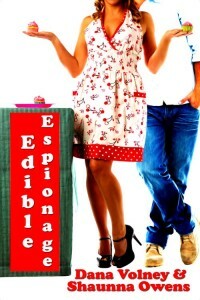 Edible Espionage is available as of TODAY! Smart and independent, Sarah Zion is a woman who rarely apologizes. As head pastry chef and co-owner of Crazy for Cake, she feels the small business pressure to keep her dreams alive. Winning the grand prize at the Trio Trifecta would be the icing on the cake. She is caught off guard when smooth talking, gorgeous Gavin Arnold folds himself into her life. When a help wanted sign appears, Gavin jumps at the opportunity to infiltrate Crazy for Cake. He sleeps, eats and breathes his personal security firm and is on an assignment to stop at nothing to make sure his client wins the Trio Trifecta baking competition, even if that means acing out Sarah’s bakery. What Gavin doesn’t see coming could cost him. Will personal feelings rise above professional obligations?